Understanding by Ship Owners and Operators. James Morgan is a Director in Oppor- tune LLP’s Process & Technology prac- million in 2018 could see a fuel costs rising to between $8.5 and $12.5 tice. He has more than 17 years’ expe- million in 2020. An Aframax which would average $2 million in fuel costs rience in the energy industry, primarily focused in the trading and risk manage- for 2018 could see fuel costs over $4 million in 2020. European Commission is introducing world will be dif? cult, as re? ners aren’t time in dry dock to install the scrubber. required to provide monitoring plans to new reporting requirements to monitor necessarily able to quickly scale to high- Depending on how many ship owners an accredited veri? er. While this new limit will not change the for certain costal carriers, there isn’t an as a fuel. tion processes lower limits in SOx Emission Control abundance of supply for LSGO at this While certainly not recommended, • Direct emissions measurements. FGE. Separately, a Wood Mackenzie uating investments in capital projects short term, when low sulfur fuel is not work. LNG; which would average $2 million in fuel coming Monitoring, Reporting and Veri- sion reporting methodology. Those able • Install scrubbers to enable them to costs for 2018 could see fuel costs over ? 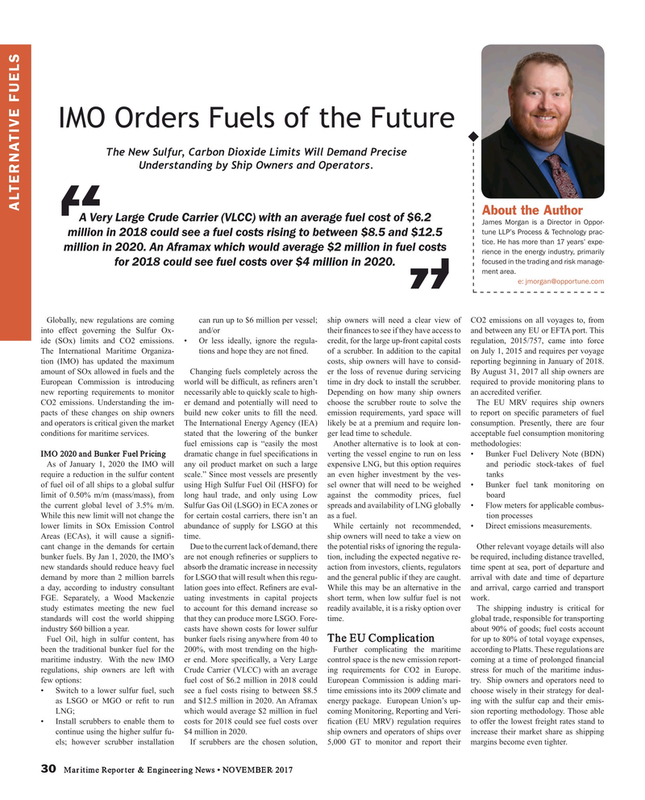 cation (EU MRV) regulation requires to offer the lowest freight rates stand to continue using the higher sulfur fu- $4 million in 2020. ship owners and operators of ships over increase their market share as shipping els; however scrubber installation If scrubbers are the chosen solution, 5,000 GT to monitor and report their margins become even tighter.